Comments: From the newest wave of Star Wars figures come Nho’ Apakk and Paploo, a 2 pack of Ewoks. Included with these little furry guys was an astromech leg; part of R3-M3. I remember a time before the prequels, when Ewoks were despised and blamed for kiddifying the beloved trilogy. Now with the prequels done, and Jar Jar taking the bulk of that criticism, the Ewoks are seeing a rise in popularity. And I say bring it on. 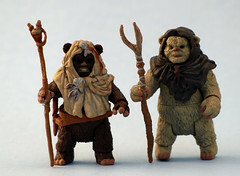 These ewok figures are fantastic – so much articulation in such a little body. They have wrists, ankles, waists, shoulders, necks…we’ve come a long way since that first Wicket. Unfortunately, I can only name about 4 Ewoks, so most of them are just crowd fillers. But they’re great little crowd fillers!